This will have to be a quick record of what I have seen and heard this week. It's moving weekend! We relocate tomorrow, to our new apartment on the Upper West Side. I am very excited about the change, but all these experiences, planned an age ago, distracted me from the most important event of my life. I was asked, once, for a word that is not in the English Language but I wish it were. I suggested a word that means both soul and body, a word that reunites the pervasive dualism in my language, and therefore in my thinking. I have three poems in Mascara, which take Eiléan Ní Chuilleanáin and Elizabeth Bishop as their point of departure. The first two "In His Other House" and "The Hospital Lift" are set in Singapore, one in an imaginary city, the other in a real one from the past, and so possibly just as imaginary. The third poem "The Bowl" is set in New York City. The city is my pastoral poem. Mascara, edited by Michelle Cahill, is "particularly interested in the work of contemporary Asian, Australian and Indigenous writers." Paul Stevens publishes my poem "The Dying and the Living," written in Yeatsian ottava rima, in response to Eiléan Ní Chuilleanáin, in The Flea. It is one of my favorites. The verse sings feelingly, without flinching. Michael Schmidt has selected the following poems for the Carcanet anthology New Poetries V: "Attribution," "A Whole History," "The Rooms I Move In," "Study #5: After Frida Kahlo," "Translations of an Unknown Mexican Poet" and ghazals from "A Lover's Recourse." All but the Kahlo poem were previously published in PN Review. Power to Facebook! Robert D. Wilson directs me to this journal of Japanese short forms, and I like what I read of its haiku section. The essay on the featured haiku poet, Serbian Slavko Sedlar, may protest too much about the bastardizing of a Eastern genre by Western writers, but the haikus it quotes are quite stunning. From Edinburgh Rob Mackenzie blogs about a haiku lecture by Madoka Mayuzumi. I like her comment about the distance between the flower heads. 'Terence' is a comic translation of A.E. Housman's book, 'A Shropshire Lad.' 'Terence' tells the story of one young man's enduring love for another, complicated by the untimely appearance of his Muse, a cow. Knowing Eric, I am sure the book is filled with literary high jinks and piercing moral insights. He talks with Wendy Chin-Tanner about the book and self-publishing at The Nervous Breakdown. The interview is opinionated and funny, and so makes a contribution to that often tiresome genre. 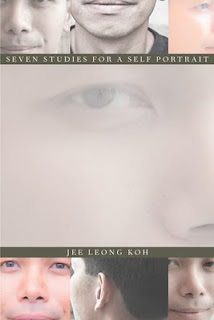 My new book of poems Seven Studies for a Self Portrait is now available on Amazon. Whoopee-whoop-whoop! Cough, cough. You can read a description of it, and a poem, about Frida Kahlo, on the Bench Press website. I switched from Lulu to Amazon CreateSpace, and the transition from one print-on-demand to another was quite painless. By paying an annual subscription, I could sell my book on Amazon, and so distribute my book that way. I have my author page up as well, with my bio and bibliography. During the printing stage, my book designer was able to contact Help Desk by phone, in order to get some design parameters right. She uploaded the files easily, and I received the proofs punctually too. Now to see how the book sells and reviews. We heard tonight we got the apartment. I wrote this rough draft to mark the occasion. today I’m here to see it..."
the light too good not to be natural light. will soon be folded, wrapped, and put away. The window above the bed is made of steel. a beech opens its palm to act a desk. singing about the changing countryside. Picked up this hardback at Housing Works for six bucks, after warning myself on entering the bookstore not to buy any books. The first poem "The Problem of Meaning" pulled me in and the book never really let go. Crenner is fascinated, bemused, by the dualities of experience and meaning, mind and world, living and writing. The poems are witty and charming. They are also laced with the poet's abiding sense of his approaching death. The film opens with an announcement: a rich industrialist is giving up his factory to his workers. We learn later that Paolo does so after being seduced by a handsome young man, who as a guest at his villa also seduced his teenage son and daughter, his wife and his maid. The young man, played by Terence Stamp, could be God or the devil, but the encounter with him changes every member of the bourgeois family. The maid Emilia returns to the country, where she refuses to eat or drink, until two children cook a meal of roadside weeds for her. She is next seen by the villagers levitating miraculously above a house, before she is willingly buried alive, her tears feeding a puddle. Almost two years ago I was interviewed by George Spencer and shot for TV by Mitch Corber for the Poetry Thin Air Cable Show. I wrote about that experience here. The show was broadcast first on Manhattan Network TV, and then on the Brooklyn one. Miriam Stanley was the second interviewee on it. Mitch has just uploaded the show on YouTube, and so now you can watch me whenever you like, reading poems from Payday Loans and Equal to the Earth, and sounding agonizingly slow. I made such weird facial expressions when reading and answering George, but the star is really my teeth. I guess that is how I look all the time, unbeknownst to me. This one is for the archive. Cyril's new chapbook-length poem records a yearning for spiritual truth and clarity. In less experienced hands, it could so easily turn hokey. It is, instead, a sensitive account of a whole-person response to Buddhist thinkers such as Jiddu Krishnamurti, Thich Nhat Hanh, Shunryu Suzuki, U. G. Krishnamurti and Alan Watts. I have only read Alan Watts, among these writers. He appears twice by name in Satori Blues, critical of the oversimplification of an Euclidean conception of the world, and critical of the hostile nihilism in Kerouac's version of Zen Buddhism. The poem tries to find its own open and gentle way. Rob Mackenzie's blog directed me to this Poetry London review by Bill Herbert of four first books. The analysis of the books is very worth reading for itself, but the opening and closing paragraphs go beyond the moment of a review. Poetry, in other words, is not announced by a striking subject, but revealed in the way we are struck.